1,136 people read this post. Have you ever been pulled in so many directions, so many obligations, invitations, and commitments that you are unable to give any of them their haqq (due)? You run late for events because you were too busy juggling three projects while making cupcakes from scratch, all so people will think you are ‘so nice’. You are often snappy with your own parents because you are so exhausted from doing all the work so that you do not disappoint your MSA brothers. Maybe your intent initially was to please Allāh subḥānahu wa ta’āla (glorified and exalted be He) when you started doing the work but somewhere along the way, a darkness crept into your heart and you didn’t even realize it. She stood in the hot kitchen wrapped in her niqab while her brothers-in-law and their friends sat at the dining table, painstakingly making another round of tamales for them. Her back ached and she knew she would miss her online Qur’an tajweed class but she kept telling herself that they only come over sometimes and she wanted them to think that she was a nice sister-in-law. It is essential to be a good host to our guests but are there times when we are setting up other people as ilah alongside Allāh? Do you find yourself hurrying through your salahs or missing your daily dhikr so that you can help a friend decorate for her sister’s wedding or help a brother find a great deal on a car? Here, you pleased your friend but displeased your Lord. He knew he was exhausted but the task needed to be done and since it was the Fundraising Committee head who had asked him, he said yes, knowing that it will mean another sleepless night for him. Do you always say yes to every event that happens at the masjid? Are you the person who is always working? Everyone else bailed out, so who steps in? You do. Why do you do it? Is it because you want everyone to like you? Or maybe you start liking being known as the person who is ever ready to do work for the deen? When volunteering becomes your life, you start enjoying the praise, the admiration. One way to check if you suffer from this disease is if or when you are replaced, do you feel resentment? If you do, then know that your intention was not to serve Allāh or to please Him but to please others and to feed your own ego. We are just not that indispensable to Allāh – His work will get done. If your efforts for the deen are taking away from your efforts for Allāh (i.e. you are missing your ṣalāh or not making du‘ā’ about the work that you are doing) then there is definitely an issue. If you ever start thinking that because you do so much, you are irreplaceable, you definitely have a problem. Know that you are addicted to the something other than God. Is the legacy you want to leave behind that you were “māshā’Allāh, such a nice person”? There is no word for nice in the Arabic language – the closest translation is lateef, which means to be kind, gentle, and aware of feelings but NOT nice. Definition for the word “nice”: socially or conventionally correct; refined or virtuous pleasant or pleasing or agreeable in nature or appearance, exhibiting courtesy and politeness. So what’s wrong with being nice? Just like with anything taken to the extreme, being too nice can hurt you when people take advantage of you and use you because you are too nice to say “NO”. This hadith is usually discussed in the context of things that are clearly haram or borderline questionable that we may do to please our boss, parents, spouse, society etc. Here, I am talking about those people who are not doing anything forbidden but are overburdening themselves and are hindering themselves from greater deeds because they cannot say no. Do you believe that others’ needs must come before your own (these are not valid needs like food or shelter but are the extra things that we do)? Do you identify with the following statements? I often do more for other people and often let myself be used so I won’t be rejected for other reasons. I often do a lot for other people because I don’t want to let them down even when I know that their demands are excessive and or unreasonable. I always think of others, especially at the expense of my own health (especially mental health). Putting others’ needs before yours. Keeping your opinion to yourself because you think it will upset others. Saying yes to every request. Feeling guilty when you say no. Feeling selfish when you do something for yourself. Suppressing emotions because you fear that if you express then you will upset others. Feeling that you have no control over your life. Going out of your way to appease others. Feeling crushed by criticism and disapproval. Thinking that it is your Islamic duty to please others. If you identified with the above statements and exhibit the common people pleasing behaviors, then you are a people pleaser. 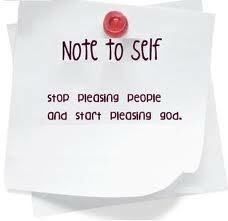 Some may ask: “What’s wrong in being a people pleaser? Shouldn’t we live our lives on earth trying to make people happy?” Think again. What is the purpose of your life? Does Allāh subḥānahu wa ta’āla (glorified and exalted be He) want us to be people pleasers? Or is our maqsad (purpose) in life to please Allāh subḥānahu wa ta’āla (glorified and exalted be He)? If in the course of making Allāh subḥānahu wa ta’āla (glorified and exalted be He) happy you are also pleasing people, then it is acceptable, but if you just spent 5 hours cooking food for someone else’s party and then spent 30 minutes complaining about it to your best friend, then the net result is an exhausted body and a depleted soul. The most destructive among the above common people pleasing behaviors is feeling selfish when you do something for yourself. Mothers tend to do this a lot. We are willing to spend hours cheering for our children’s soccer games but will feel guilty for slipping out to spend an hour on the treadmill. Many of us will spend hours organizing our husband’s closets but feel guilty going to a halaqah for an hour. We slave away at these relationships, avoiding all conflict and all negative emotions, but they are simmering inside us and will eventually lead to stress and health problems. If you keep continuing in this way, then you will either burst with hostility at some point or will fall into depression. And remember how the Prophet was pleased with the man who baked bread for his companions while on a journey. Really ask yourself: Why do you do the things that you do? Correct your niyyah at every step. Do what you do solely for the sake of Allāh. If you feel like doing it to earn His Pleasure and not for anyone else then alḥamdulillāh you are on the right track. Previous South Africa going down the drain? Muslims, this is what YOU can do for your country!